Brunch is the one of the highlights of the expat weekend. In every place I’ve lived, there has always been one particular place that we end up spending almost every Saturday and/or Sunday morning in. These places are all unique and as far as I know, none of them are franchises. Ku De Ta’s location right on the beach coupled with its’ chic design makes it a one-of-a-kind breakfast place and an expat magnet. It opens early and is a restaurant/bar/beach club/cigar lounge all rolled into one. Dinner is good too and needless to say, the place is pumping all night long and with the sun loungers and great breakfasts, you won’t even have to go home at dawn. My sister-in-law, Silvia, took me here for lunch several years ago and we really enjoyed it. 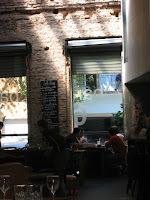 Ever since then, my husband and I make it a point to stop by bar6 each time we visit Buenos Aires. They open from 8 a.m. till late and are usually full. The crowd is a mix of artsy locals, chic Porteños and expats. Great for hanging out with a book and a coffee, brunch on the weekend or even after-dinner drinks when they pump up the music with the in-house DJ. Also an excellent stop for when you explore Palermo Viejo’s shops. Although this is more of a deli than a classic breakfast place (they don’t have the full eggs and bacon option) it’s on this list because it has a great selection of sandwiches and salads, a cool-looking interior and lots of people hanging around. It’s fine to go it alone or with kids or a deux – this place is casual and friendly. You can always enjoy a large coffee with an even larger slice of homemade cake or linger over a salad and sandwich lunch. They have a small front garden with outdoor tables but with the desert heat, better to grab a table inside or upstairs on the breezier terrace. This being Dubai and liquor licenses almost impossible to come by, the Lime Tree Cafe is a non-alcoholic hangout. I first came here in the early 1993 when it was hidden away in a small street off the boulevard St. Germain. It was packed to the rafters every weekend with English-speaking expats clamoring for weekend brunch. My sister and I spent many Saturday mornings here waiting for a table. It was also our choice for when we just needed a hamburger and a milkshake. The atmosphere was noisy and crowded and the tight tables conducive to making friends. It’s still the same except now they’ve moved to larger premises beside the Village Voice bookshop on the Rue Princesse. they’ve also branched out in the Rive Droite and Neuilly. 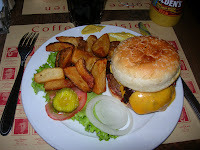 Coffee Parisien continues to cater to expats but there are lots of locals as well looking for a taste of America. Breakfast and brunch are still on the menu along with those famous hamburgers as well as a large selection of daily specials, sandwiches and salads. Lots of places in Marbella serve breakfast and are open all day but Terra Sana’s food quality, free Wi-fi, numerous magazines and newspapers, friendly staff and all sorts of expats under the Spanish sun make it the best choice in town. There are plenty of breakfast options and Lavazza coffee plus a super selection of wraps and salads along with a daily changing list of specials. There is an extensive wine list as well and a daily happy hour from 5 to 7 p.m. 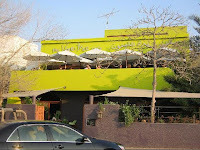 Pity that the one near us closed recently so now we have to drive down to Puerto Banus to get our Terra Sana fix. It’s been ages since I’ve set foot in Moscow but I hear from my friends that the Starlite is still there. When they opened in the early 90’s, it quickly became the place to have breakfast on the weekends. 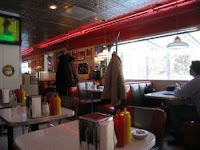 It’s conveniently located in a small park off the ring road and is basically an aluminum trailer kitted out as a typical diner with the standard interiors – red leatherette booths, Formica-topped tables, bar stools, black and white checked linoleum and ketchup and mustard in squeeze bottles. The only thing missing here is the gum-chewing smart aleck waitress (or maybe not anymore). The all-American menu and the fact that it’s open 24 hours is a real draw. It’s probably the only place in town where you see expat couples and families sharing the space with party goers who just finished clubbing all night tucking into their fried breakfasts on the weekend. Not the place for a lover’s tryst but great for a midnight snack on those long, dark Moscow winters. This cafe serves all the typical breakfast items and lots of newspapers and magazines if you decide to eat solo. In the El Bosque area, it’s where you go for brunch or lunch. Cafe Melba’s Aucklander owner, Dell, is there to check that everything is running smoothly and those frothy cappuccinos keep coming. These next ones on my list are not necessarily expat hangouts but are great places for breakfast that both tourists and locals frequent and where we used to go. Opened in 1942 as a simple place for workers to get a decent meal by Hymie and Freda Skolnick. This place has become a Montreal institution. Hymie still hangs out at the counter and assigns seating to everyone walking in while his son helps out. It’s a great place for breakfast and has a strong local clientele who have been going there for years. Visiting celebrities enjoying Montreal’s party scene are also frequent diners. The menu is simple but has all you expect from a typical diner and the mixed crowd and people watching is always lots of fun. Sit at the counter if you’re alone and strike up a conversation with Hymie about the good old days. Keep in mind though that this isn’t a place to hang out with a cup of coffee (except when on weekday afternoons when it’s a bit quiet). Eat up and pay before Hymie seats someone else at your table. There are loads of interesting brunch options in Manhattan where power brunches rank high on the weekend social agenda. 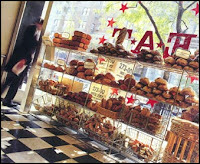 If you’re in the mood for “painfully hip” then Balthazar in Soho is the place to go but in my opinion, Eli Zabar’s E.A.T. on Madison is where you get to see the locals, or at least the “upper east side locals”. There is an excellent deli and takeaway service, wonderful breads and pastries but also a bustling cafe in the back with serving breakfast items and excellent deli sandwiches all day long. 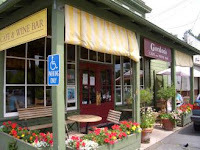 Yountville’s main street boasts several fine dining establishments including The French Laundry, probably the most well-known restaurant in America. At the very end of this street across the gas station is a small unassuming one-story building with a large front porch and a screen door. Step inside and you immediately understand why I love this place. It’s small and cozy and not pretentious. There are lots of delicious things to eat and the valley’s movers and shakers stroll in and out for breakfast or coffee.